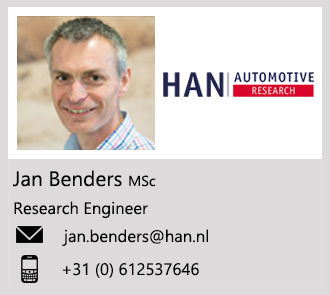 HAN Automotive Research supports companies in the development of electronic control systems and in the creation of "software tools" with which these "control systems" can be developed. Control systems ensure that a machine performs certain tasks or adjusts processes. In order to set up a "Control System", accurate analysis of the desired process is first made and it is then converted into a model. When this model has been developed in such a way that it corresponds to the intended process, it is converted with the code generation program, with which the controller is programmed. HAN-AR has developed its own coding software "HANcoder" for this purpose. This software supports a number of standard ECU’s. Often it is necessary or desirable to monitor a process or to fine-tune a programmed ECU to the desired process. For this HAN-AR has developed its own software "HANtune". With this, the input and output signals are displayed on a screen with the help of a dashboard that you want to build. Parameters of the process can also be changed with HANtune so that the behaviour of the process can be adjusted or calibrated. HANtune also has feedback to HANcoder, so any changes to the programming of the subsequent ECU’s can be included immediately. Many companies, especially in SMEs, have a huge expertise in their own field. When developing new products or automating the production process, the design of the Control Systems often requires extra expertise, for which they can rely on HAN-AR. HAN-AR offers with HANcoder and HANtune an affordable development platform for the development of the Control System. The support is not only useful in the development of prototypes but can also be used in robust solutions for series production.